Tanaka Kikinzoku Kogyo K.K. has been handling precious metals for 125 years. The Company has contributed to the evolution of frontier industrial products by offering precious metal materials and developing technologies to apply such materials. Today, the Company is focusing on its environmental- and energy-related business. We spoke with Mr. Hidemasa Tanaka, Director and Head of the Technology Development Department at Tanaka Kikinzoku Kogyo K.K., as well as other employees involved in technology development. Our discussion concerned the main roles of precious metals in the field of "new energy," which is one of the four major pillars of the Company's environmental- and energy-related business, as well as the Group's latest efforts in this area. Director and Head of the Technology Development Division, Tanaka Kikinzoku Kogyo K.K. —How do precious metals relate to new energy? 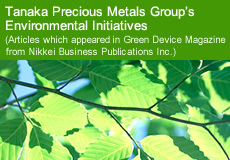 Along with the "development of environmentally conscious materials," "resource recycling," and "environmental cleanup," "new energy" is one of the four pillars of Tanaka Precious Metals Group's environmental and energy related business (Figure 1). The Group, which also endeavors to develop new applications for precious metal materials, has established a superb track record of offering products and services in the electronics field. The Group considers new energy to be a new frontier that follows from electronics and so has been aggressively developing technologies for the new energy market. There are many technologies in the field of new energy for which precious metal materials are useful. For example, precious metal materials play an important role in both fuel and solar cells, which have been drawing attention in the energy creation field. Precious metal materials are also used in key hydrogen production technologies, which are used for both creating and accumulating energy. Furthermore, precious metals greatly contribute in a variety of ways to energy saving, which has been drawing heightened attention throughout our society. — Please tell us what specific roles precious metals play in the field of new energy. First, let's talk about fuel cells and solar cells, which are now gaining widespread attention in the energy creation field. In fuel cell technology, the chemical energy of fuel is converted to electrical energy using electrochemical reactions. Fuel cells also feature higher power generation efficiency than that achieved by the conventional power generation method. Moreover, the substances emitted during their power generation processes do not burden the environment. Fuel cells make use of the reaction between hydrogen and oxygen, which generates water. There are a number of types of fuel cells; precious metals are used for PEFCs (platinum and platinum ruthenium alloy/carbon catalysts electrolyte membrane fuel cells), DMFCs (direct methanol fuel cells), and PAFCs (phosphoric acid fuel cells). In these cells, precious metal materials are used as electrode catalysts to cause reactions between hydrogen and oxygen. Specifically, carbon particles (carriers) with a diameter of approximately 30 nm are associated with platinum (Pt), platinum cobalt (PtCo), or platinum ruthenium (PtRu) particles with diameters in the range of 2 nm to 4 nm in the catalyst (Figure 2). Tanaka Precious Metals Group began developing electrode catalysts in 1985, and this has now led us to enter the field of new energy. Currently, our business focuses on PEFCs and DMFCs, and we have a share exceeding 60% in these markets. We are currently making efforts to develop catalysts that realize high performance, low costs, and improved durability for fuel cells. — What can you tell us about solar cells? There are a variety of types of solar cells and precious metal materials play important roles for each type. For example, silver (Ag) pastes are used as wiring material for silicon (Si) crystal and thin-film silicon solar cells, which are already in widespread use. Silver is also used for the reflective films applied to the rear surface of cells. In compound solar cells that do not use silicon, silver is also used as a wiring material and for reflective films. Precious metal materials play an especially important role for dye-sensitized solar cells. Dye-sensitized cells make use of the dye's characteristics; under light, the electron energy level increases, causing titania (TiO2) to flow into the electrodes. Dye-sensitized solar cells can be manufactured at a lower cost than silicon solar cells. In addition, because colorful solar cells can be developed by combining dyes of various tones, it is easy to imagine that they will find practical use across a wide range of areas. Currently, the development of a number of dye materials is underway with the aim of realizing this type of solar cell. Ruthenium (Ru), a precious metal material, is used for all such dye materials. Tanaka Precious Metals Group began development of a dye for use in dye-sensitized solar cells in 2009. We are one of the few companies able to reliably supply ruthenium, a platinum group metal. Moreover, we have a great deal of know-how related to technology for fusing organic materials (which are the raw materials used for the dye) with metals. We are confident that we can provide excellent materials by making the most of this strength. Our immediate goal is to develop a material that enables practical use of dye-sensitized solar cells with a high sunlight conversion efficiency of approximately 10%. The market for dye-sensitized solar cells is forecast to materialize by 2012, and we are planning to finish developing our technology by that time. Technology Development Division, Tanaka Kikinzoku Kogyo K.K. — What roles do precious metals play in hydrogen production technology? Hydrogen is now receiving attention as an environmentally-friendly clean energy. For example, fuel cell vehicles use hydrogen as a fuel. Also, development of hydrogen-operated engines is underway. To use hydrogen, the development of a system capable of efficiently producing hydrogen is indispensable. One material used to produce hydrogen is water; electrolyzing water produces hydrogen. In fact, platinum, iridium (Ir), and other precious metals are the primary materials comprising the electrodes used to electrolyze water. A system for producing hydrogen by modifying city gas has already been put into practical use. In this system, the reformers use ruthenium-based catalysts. Hydrogen permeable films using palladium (Pd) are another technology expected to be widely applied to produce hydrogen. One characteristic of palladium thin films is that only hydrogen passes through them. By making use of this characteristic, extremely high purity hydrogen can be extracted from gases containing hydrogen. This technology has already been practically applied in ultra purification to process gasses used in the manufacturing of semiconductor devices as well as for other purposes (Figure 3). Among the advantages of hydrogen energy, the most notable feature of this technology is that it allows devices to be made smaller thanks to the ways in which it enables device structure to be simplified. Currently, in the hydrogen production systems used in fuel cell vehicles, natural gas or methanol is refined and then the unnecessary components are removed using an absorbent by means of pressure swing adsorption (PSA). If such systems are replaced with one that refines natural gas or methanol by means of palladium membranes, the cubic volume of the devices in question can be reduced to one-third the former size. Furthermore, the temperature for the reforming process can be lowered from the range of 700 to 800°C to the range of 500 to 550°C while at the same time raising production efficiency from 30 to 70%. To put devices using this technology into the hands of consumers, the throughput of the system using hydrogen permeable films must be further improved. To do so, a technology for manufacturing very thin (approximately 10 μm) flawless palladium thin films must be developed, as the amount of hydrogen that passes through films increases as the films become thinner. Tanaka Precious Metals Group has already realized a technology capable of manufacturing thin palladium films of thickness 5 μm, and based on this technology, the Group is preparing to mass produce hydrogen permeable films. In Japan, a plan to put hydrogen fuel stations into practical use by 2015 is in progress. Our immediate goal is to develop the previously mentioned thin films by that time . — Please tell us about your efforts in the field of energy saving. Mr. Noriaki Hara Deputy Head of Marketing Department, Tanaka Kikinzoku Hanbai K.K. Among the many energy saving applications of precious metal materials, the LED market is expected to grow significantly. High-intensity discharge white LEDs are suddenly in the spotlight as energy-saving lighting sources because they consume less power than conventional incandescent lamps while maintaining the same level of brightness. Such LEDs are expected to be used all over in the future, including at factories, offices, and residences. Another energy-saving application of LEDs that should not be forgotten is backlights for large LCD TVs. Although cold cathode tubes have conventionally been used for such TVs, the movement to replace them with LEDs is rapidly underway because LEDs help reduce power consumption. Various precious metal materials serve as components in white LEDs. 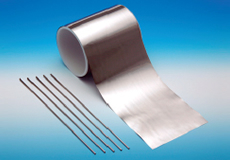 For example, gold (Au), platinum, and many other kinds of precious metal materials are used as electrodes, barrier metals, and other layered metal thin films. High-intensity discharge white LEDs have a reflective film for increasing the light utilization efficiency at the bottom of the emission layer, and silver alloy is used as the material for this reflective film. In addition to silver alloy, silver-tin (Sn) alloy is used for package seal materials. Precious metal materials play an important role in the manufacturing processes of LED component materials as well. For example, sapphire single crystals are used for LED device substrates. To develop sapphire single crystals, iridium, which has a high melting point, must be used for the crucibles. 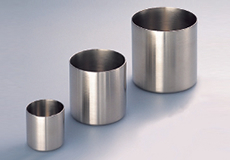 Iridium crucibles are one of Tanaka Kikinzoku Kogyo K.K. 's most important products (Figure 4). — It certainly seems that precious metal materials play extensive roles in the field of new energy. Exactly! In addition, there are quite a few applications for which there are no alternative materials. This means that precious metal materials have very important roles to play in the field of new energy. Besides developing fundamental technologies to expand the potential of precious metal materials in this field, Tanaka Precious Metals Group is also committed to making such technologies practical in collaboration with device manufacturers, equipment manufacturers, and other manufacturers of products to which such technologies are applied. In the practical use phase, we plan to support manufacturers of applied products as well as users by supplying materials and in other various ways. We are also committed to recycling precious metal materials in order to most effectively use scarce resources. As the various technologies now under development enter the practical use phase, the presence of Tanaka Precious Metal Group will further be heightened. Watch for our future initiatives in the field of new energy!